Temperature (T): A measure of heat energy, expressed in degrees Fahrenheit (F) or Celsius (C). Heat energy drives chemical reactions. Relative Humidity (RH): A measure of how saturated the air is with water vapor, the %RH determines the amount of water contained within collection objects. Dew Point: A measure of the absolute amount of water in the air, the DP is the temperature at which the air cannot hold all the moisture in it and water condenses. Without humidification (the addition of moisture) or dehumidification (the removal of moisture), the indoor DP is the same as the outdoor DP. 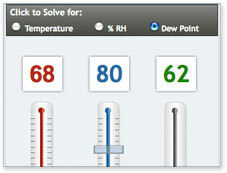 Every environment has exactly one combination of temperature (T), relative humidity (RH) and dew point (DP). Change any of these variables and you will have a different environment. How are T, RH, and DP related? How do T, RH, and DP determine preservation quality? High temperatures (generally above 75°F/24°C) increase the rate of chemical reactions, which determines how fast or slow organic materials will decay or "naturally age". Cool temperatures slow the rate of chemical decay. Lowering the T can improve preservation IF you also maintain an appropriate RH (determined by the dew point). At higher temperatures biological activity (insects, mold growth) increases. High RH (generally over 65%) can result in mold, metal corrosion, and mechanical damage. Low RH (generally below 35%) can result in mechanical damage. Wide and frequent RH fluctuations influence the rate of mechanical decay. The DP determines which T will give you which RH.